Copyright: © 2015 Machida Y. This is an open-access article distributed under the terms of the Creative Commons Attribution License, which permits unrestricted use, distribution, and reproduction in any medium, provided the original author and source are credited. Malignant fibrous histiocytoma is a type of soft tissue tumor that frequently occurs in the limbs, trunk, retroperitoneum, etc. We herein report a case of MFH occurring in the thoracic wall, which was accompanied by hemorrhage in the pleural cavity. A 79-year-old male transferred to our hospital for a detailed examination of a chest wall tumor in his right back. The tumor was diagnosed as pleomorphic malignant fibrous histiocytoma (MFH) by an incisional biopsy. Before the scheduled operation, the patient developed right upper abdominal pain. A CT, blood test and pleural puncture revealed that the patient had a massive hemothorax, which required emergency surgery. The eighth, ninth and tenth ribs and intercostal muscles, along with the seventh intercostal muscle, were resected, which enabled the tumor to be completely removed. MFH originating in the thoracic wall is rare; but it is important to be aware of the risk of hemothorax when MFH is exposed directly to the pleural cavity. Malignant fibrous histiocytoma (MFH) is one of the most common malignant soft tissue tumors in adults . MFH mainly occurs in the limbs, trunk and retroperitoneum, but is rarely found in the thoracic wall. Although the symptoms of patients with MFH originating from thoracic wall are usually chest/back pain and a subcutaneous tumor, hemothorax is rarely associated with MFH. In this study, we report on our experience with a case of MFH originating in the thoracic wall that was accompanied by pleural cavity hemorrhage. A 79-year-old male with chronic renal insufficiency visited a regional hospital due to pain and a subcutaneous tumor in his right back, and was transferred to our hospital. A chest CT examination showed a 7 cm × 7 cm tumor mass shadow appearing to invade between the eighth and tenth ribs (Figure 1A), which was diagnosed by incisional biopsy as pleomorphic MFH. The FDG-PET findings were consistent with the diagnosis, showing a high FDG accumulation (SUVmax 18.25, Figure 1B). Since no metastasis was noted in other organs, surgical resection was scheduled. Because the patient had a history of atrial fibrillation and stroke, he was taking an oral anticoagulant and antiplatelet medication. He ceased taking these drugs prior to surgery, changing to the continuous intravenous injection of heparin (12,000 units/day). Before the scheduled operation, the patient developed right upper abdominal pain. A CT showed a buildup of fluid in the pleural cavity on the tumor side, and the fluid was proven to be blood by pleural puncture, thus leading to emergency surgery (Figure 1C). A blood test showed a normal prothrombin time/activated partial thromboplastin time and a decrease in hemoglobin. Under general anesthesia, surgery was commenced with an incision of roughly 20 cm. The eighth, ninth and tenth ribs and intercostal muscles, along with the seventh intercostal muscle, were resected, which enabled the tumor to be completely removed (Figure 2). The thoracic wall was reconstructed using Bard MeshTM (15X15cm, 0112720, Davol Inc., RI, USA). A 24Fr drain was placed in the pleural cavity, and surgery was completed. The postoperative course was uneventful. The tumor measured 12 cm × 8.5 cm × 8 cm and showed proliferation of highly pleomorphic, severely dysplastic cells and spindle cells with no specific differentiation. 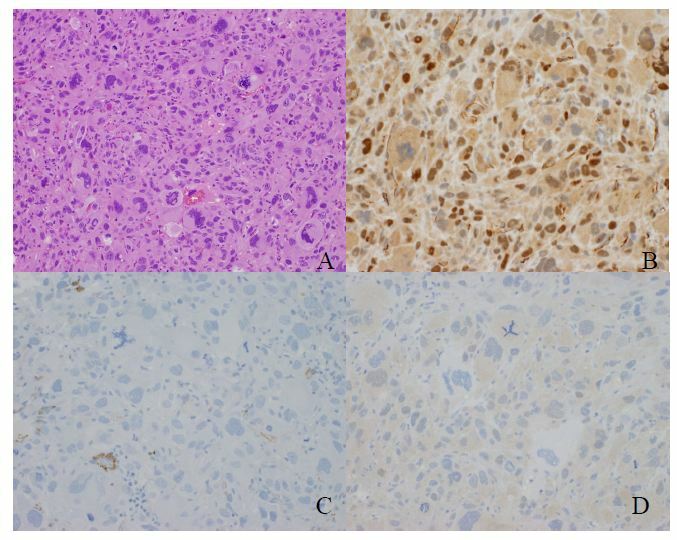 The tumor cells were CD34-positive, partially α-SMA-positive, S-100 protein weakly positive, CK(AE1/AE3)-negative, and desmin-negative (Figure 3). Hemorrhage and cyst formation in the tumor were also noted. MFH is a rare malignant tumor, derived from mesenchymal tissue in the whole body. In 1964, a series of 53 cases of MFH, including suspected MFH, was reported by O'Brien . In 1978, Weiss et al. reported the symptoms of MFH in detail , and the disease is now the most frequently diagnosed soft tissue tumor among adults. The etiology of MFH was not fully understood although some reports suggested that previous radiotherapy was associated with developing MFH [3,4]. According to Weiss et al., only 15 (7.5%) out of 200 MFH cases occurred in the thoracic wall . On the other hand, according to King et al., 19 cases (21.1%) out of 90 thoracic wall tumors were MFH , and MFH was considered to be the most common malignant tumor in the thoracic wall. The prognosis of patients having MFH was poor, with a survival rate of 40% after two years . Surgical resection is the preferred treatment for MFH. However, the recurrence rate after surgical resection is high. According to a report by Pezzi, et al., a 37% localized recurrence rate was noted among surgically resected cases . A report by King et al. stated that the recurrence rate fell to 44% when there was a 4 cm free margin from the tumor, compared to 71% with a 2 cm margin , and it is important to ensure a sufficient margin around the tumor during resection. 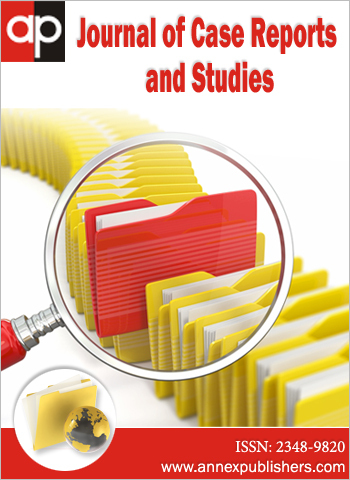 To the best of our knowledge, there have been no reports in the English literature although some reports in the non-English literature of MFH originating in the thoracic wall accompanied by hemothorax were published , making this the second report worldwide. The cause of the hemorrhage in the present case is still unclear. The anticoagulation therapy might have influenced the clinical course, but both the prothrombin time and activated partial thromboplastin time were within the normal ranges at the time of hemothorax. Hemorrhage is sometimes noted within the tumor , and the pathological findings of the present case indicated that the hemorrhage was observed in the tumor, and the tumor had a rich blood supply, which might have been related to the hemothorax. 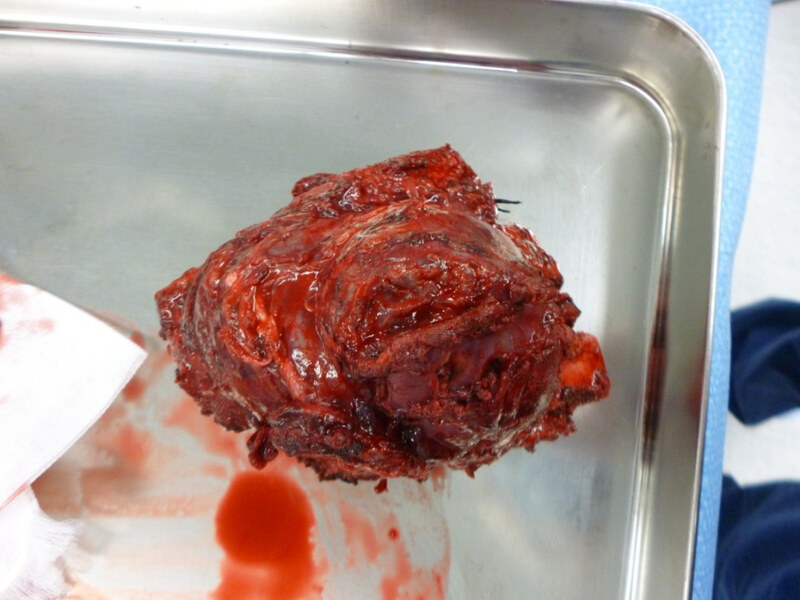 In this case, the tumor was exposed to the pleural cavity almost directly, suggesting the possibility that the hemorrhage occurred due to contact between the tumor and the surface of the lung. It is important to be aware of the risk of hemothorax when MFH is exposed directly to the pleural cavity. We are greatful to Mr. Katsuaki Sato, Department of Pathology II, Kanazawa Medical University, for the pathologic interpretation. 1 O'Brien JE, Stout AP (1964) Malignant fibrous xanthomas. Cancer 17: 1445-55. 2Weiss SW, Enzinger FM (1978) Malignant fibrous histocytoma: an analysis of 200 cases. Cancer 41: 2250-66. 3 Zhang GB, Li J, Zhang PF, Han LJ, Zhang JT (2014) Radiation-induced malignant fibrous histiocytoma of the occipital: a case report. World J Surg Oncol 12: 98. 4Alkatan HM, Maktabi A (2010) Malignant fibrous histiocytoma in a patient with history of treated retinoblastoma. Saudi J Ophthalmol 24: 23-6. 5 King RM, Pairolero PC, Trastek VF, Piehler JM, Payne WS, et al. (1986) Primary chest wall tumors: factors affecting survival. Ann Thorac Surg 41: 597-601. 6 Pezzi CM, Rawlings MS, Esgro JJ, Pollock RE, Romsdahl MM (1992) Prognostic factors in 227 patients with malignant fibrous tumor histiocytoma. Cancer 69: 2098-103. 7Hachiya T, Okada K, Yamazaki Y, Hayasaka M, Yoshikawa S, et al. (1996) Pulmonary malignant fibrous histiocytoma presenting as hemothorax. Nihon Kyobu Shikkan Gakkai Zasshi 34: 336-40. 8 Chen HC, Chen CJ, Jeng CM, Yang CM (2007) Malignant fibrous histiocytoma presenting as hemoperitoneum mimicking hepatocellular carcinoma rupture. World J Gastroenterol 47: 6441-3.